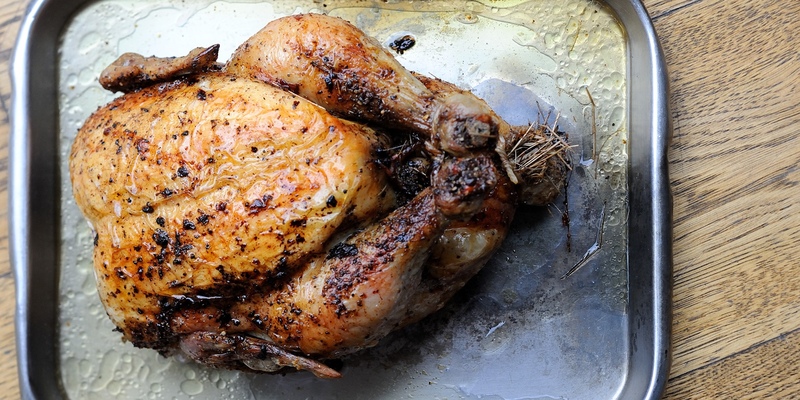 Roast chicken is a staple Sunday roast favourite in many homes in the UK. One of the most simple meals, when cooked properly with crisp skin, moist white breast and richer leg, it is a real treat. Don’t limit this feast to Sundays; it is often cheaper to buy the whole bird than individual joints and is much more flavourful. Vary the herbs stuffed inside the chicken; try tarragon, rosemary or oregano. You could also try rubbing garlic into the skin or sprinkling it with spices such as smoked paprika or black pepper. For an extra smoky flavour, roast your chicken on the barbecue. Roast chicken is most commonly associated with Sunday lunch however this need not be the case. Roast chicken is delicious in sandwiches for lunch or with coleslaw and new potatoes for a light summer supper.